The 20,000-square-foot building will have the capacity for 120-140 employees. Xpanxion’s current Kearney facility at 810 E. 56th St. has capacity for 75 employees. Once the Tech oNE building is complete, the entire Kearney operation will move there. No detail is spared to shape the space into a state-of-the-art facility where work and play collide . . . Plans for the technology park also include the construction of Nebraska’s largest solar energy array. 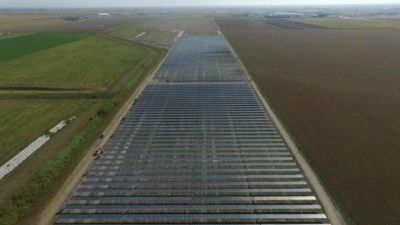 Officials with Chicago-based SoCore Energy, Nebraska Public Power District and the city entered a 25-year agreement in February to build a 5.8 megawatt, $11 million solar array on 53 acres of the park. Construction for the solar array began in June. Read more here. Photo: Kearney’s solar farm consists of approximately 23,000 panels on 53 acres at Tech oNE Crossing, The panels are mounted on a tracker-designed racking system. To date, the array is Nebraska’s largest solar project. It will generate 5.8 megawatts of electricity, or about 5% of Kearney’s peak demand. 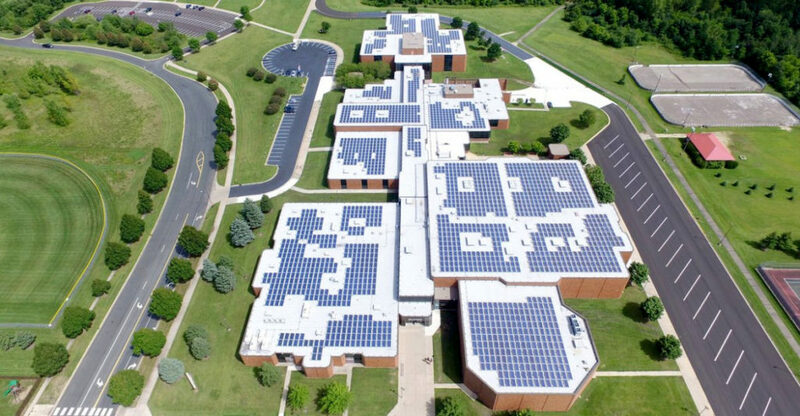 Purchasing solar energy fits in with UNK’s long-term plan to improve its environmental impact. UNK rolled out a sustainability plan last year. UNK is beginning to work towards reducing emissions by 13 percent, increasing the recycling rate to 50 percent, reducing energy consumption by 25 percent, reducing water consumption by 15 percent, making the campus 75-percent commute sustainable and using 50-percent green purchasing by 2025. By 2050, UNK plans to be 100-percent climate neutral and have a 90-percent recycling rate. This entry was posted in Nebraska / Midwest News and tagged Kearney Solar Farm, Kearney's Tech oNE Crossing Technology Park, NPPD's SunWise Community Solar Program, The City of Kearney, University of Nebraska-Kearney, UNK Sustainability Plan, Xpanxion on December 8, 2017 by Helen Deffenbacher.